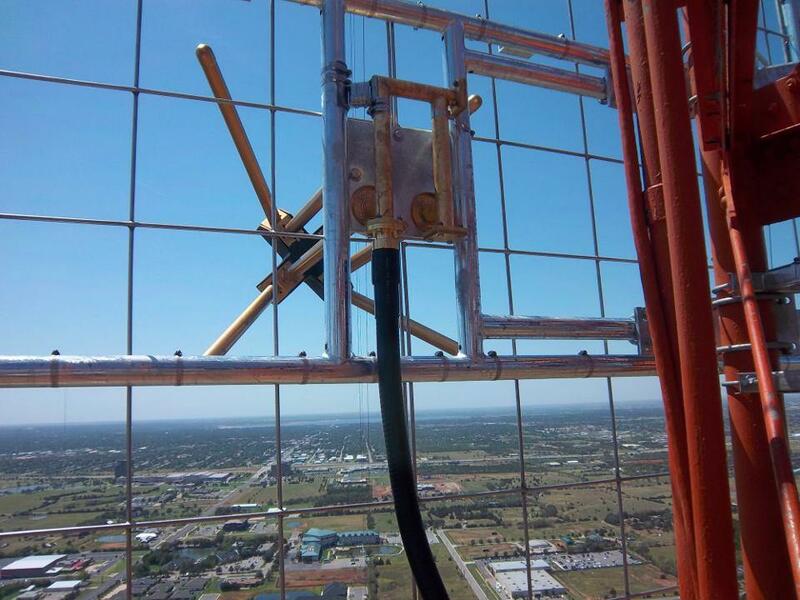 The view from 640 feet in the air at the KROU-FM transmitter in Oklahoma City. Editor’s Note: This article was originally written by former KGOU Chief Engineer David White (1983-2006) and updated in 2013 by Chief Engineer Patrick Roberts (2007-present), and Operations Director Brian Hardzinski. I'm sure many of you have experienced difficulties in picking up the KGOU broadcast signal at one time or another. Of course, obvious equipment failure in the broadcast transmission chain for KGOU's equipment could create listening difficulties. However, there are more subtle things that can create occasional reception problems for the listener. FM broadcasting is normally a line-of-sight operation. Unfortunately, there are events in the world of atmospheric physics that can temporarily change this, making the signal nearly or totally un-listenable. In these cases, it is not your radio or KGOU's equipment. This primarily occurs in the spring and fall due to temperature inversion where the temperature of the atmosphere actually rises with altitude. Effects of temperature inversion, on occasion, permit other FM broadcast stations located beyond line-of-site to interfere with local stations on the same frequency. In this instance, the interfering station can sometimes be strong enough to override local signals such as KGOU. This most commonly will occur in the early mornings for us and effects will generally disappear by noon. Here's a map of propagation in near real-time. If there is a lot of activity on this map indicated around the Oklahoma City area, especially if it's orange or red in color, it is likely we are experiencing some form or tropospheric ducting. Next, something called “sporadic E” is another possible cause of reception problems for KGOU listeners. In this instance, the E layer of the ionosphere, under certain conditions, can reflect the signals of other FM broadcast stations located beyond line-of-site. Once again, signals from distant FM stations can override local FM signals on the same frequency. Our translators, especially our Ada translator, can be affected greatly by tropospheric ducting issues. The FCC requires our translators to be fed via over-the-air reception. This means that we have equipment that acts effectively like a radio receiver that picks up our main station signal (or another translator in the case of Ada), and repeats it to listeners in the area the translator serves. Most of our translators pick up the 106.3 signal directly over-the-air. In Ada, the translator receives the 103.1 Seminole translator signal, due to the distance from our main signal. Because of this double hop, anything that goes wrong, including a failure of or interference to the Seminole signal in any way, will jeopardize reception of our Ada translator. The good news is that KGOU now has a 2000-watt station southwest of Ada that will be fed audio directly to its transmitter, eliminating the interference problem. Sometimes the signals of KGOU, and our extended signals, simply do not cover areas of town that we'd like them to, especially for listeners on the fringe of our coverage area. Terrain and our facilities play into this from the station end of your reception. Signal power is regulated and limited by the FCC. Both of KGOU's metro signals are "class A", a designation that was originally intended to be localized service, as opposed to more powerful stations on the band. This comes partially from the fact that KGOU started out as a commercial radio station in the early 1970s and was converted to a non-commercial station in 1983. Even in the early 70s, most other channels were already taken. In many ways, OU was very lucky to be able to get the license at all. KROU (105.7 in Oklahoma City) is also a Class A station, and one of the last available brand new allocations available for our area when it was licensed in the early 1990s. OU was fortunate, once again, to get our 105.7 signal for our listeners in the Spencer/Oklahoma City area. In 2011 we increased our height from 300 feet to 640 feet to slightly help our coverage, but were required to decrease power in the process - a trade-off in many respects. As simple as it sounds, a better antenna will generally help FM reception greatly, and in most cases very inexpensively. A simple dipole antenna like the Radio Shack 42-2385 attached to a radio that has an antenna port can really work wonders. You may have to also have a matching transformer, depending on your radio's antenna connector: 15-1253. A step up from the inside dipole is an outdoor antenna. Here's a really good omni-directional FM antenna for outside: 15-291. Keep in mind that television antennas make wonderful FM antennas too! Our 105.7 signal comes from the same area as most television signals. A splitter like this 15-1234 could quite possibly provide enough signal for both your television reception and FM radio reception, if you have an outdoor antenna. A good tabletop radio that already includes a whip antenna is a Grundig 8, which is carried by Radio Shack as a 20-438. An even better radio is a Sony HD radio. For KGOU reception, it's simply a much better FM analog receiver. The XDR-S10HDiP is available at Best Buy as SKU# 9226713. If no speaker is needed because you intend to connect the radio to a home stereo system, then a tuner only would be great. The Sony XDRF1HD is available from Fry's Electronics. In addition to listening via your computer or a smart phone (iPhone, Droid, etc. ), you may desire a simpler method to listen to the station when the over-the-air signal is unavailable. We have found the Sangean WFR-20 WiFi Internet Radio to be a good one. There are several others out there that also will work great. KGOU is listed in many internet catalogs including Shoutcast and Reciva. We offer many different ways to listen as far as different types of streams in help insure compatibility. Please do not hesitate to call our engineer, Patrick Roberts, at (405) 325-1603.